Mobile Wireless Printing - Iteam Resources Inc. Designed for a Mobile World! iTeam’s wireless printing subscription provides patrons the ability to print from anywhere to your library branch locations. What is Mobile Wireless Printing? Mobile Wireless Printing enables your patrons to easily and securely print documents, emails and web content from their Internet-enabled laptops or wireless handheld devices to a printer located in your library. Your patrons can send print jobs from anywhere; in the library, at home, from school, and securely release them at your printer. • Simple. Mobile Wireless Printing is a simple solution. No printer, drivers or software to install and uninstall from your patrons laptops. • Reduce support costs. 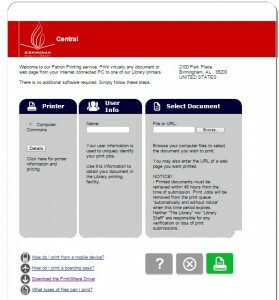 The easy-to-use service minimizes queries about printing to your staff. • Secure. All data is transferred and encrypted using Internet security standards ensuring privacy and security in every transaction. • Cost Recovery. PrintSpots Library can be integrated with an existing or new cost recovery system. • Printing Outreach. With Mobile Wireless Printing, any library patron can utilize the library printer from home as a back-up when their home printer fails. • Free up library PCs. Your patrons can print using their own wireless handheld devices and laptops. release keypad. The device virtually conﬁgures itself. No software to install. No computer to administer. Our PC deployment requires installation of the Mobile Wireless Printing software on any non-dedicated, networked PC in the general area of the networked printer. This installs on your existing hardware. What is Mobile Wireless Printing software? iTeam Resources hosts the server for Mobile Wireless Printing. This secure server performs the document conversion and intelligent, secure delivery to the target printers at each printer location. Mobile Wireless Printing software is installed on the PrintConnect™ network device or on an existing Windows PC and operates as a background task for commonly needed print queue and delivery functions. With iTeam, data is transferred and encrypted using Internet security standards ensuring privacy and security in every transaction. • Web transactions that include user information or print data are conducted using secure SSL communications. • Users may enter, or are given, a conﬁdential print release code. In unattended environments, such as a self-serve business center, the documents are held until the user provides the code to release their document. • Print data in transit is encrypted using 128 bit AES and standard RSA public/private key pairs, ensuring that documents can only be encrypted with key pairs known by the iTeam software.